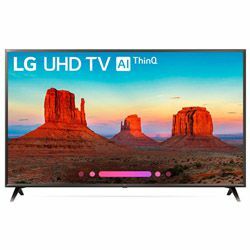 It’s exciting to compare the Samsung 65NU8000 vs LG 65UK6300PUE because both models were represented in the 2018 year and are products of well-known companies. The first device belongs to the NU8000 series, which conquered users with stunning high dynamic range and quick-working Smart TV. The second model is a part of a UK630 series, each representative has the LG ThinQ AI and Amazon Alexa. Samsung’s TV is regarded as an expensive unit, while the LG’s TV is affordable for middle-class users. The LG 65UK6300PUE vs Samsung 65NU8000 comparison shows that the first model has a mediocre native contrast ratio. The black color is not saturated and it lacks uniformity. The Samsung’s device is able to produce deep black scenes; even the local dimming feature has a negligible impact on the contrast ratio. The 65NU8000’s viewing angle is very poor, while the 65UK6300PUE allows the black levels to stay accurate irrespective of angle. Both devices have ads within the content, but Samsung’s TV provides me with a bigger number of these annoying advertising than LG’s. The 65NU8000 is complemented by the HBO and Google Play, which are quickly launched and have no pauses in work. The 65UK6300PUE even can’t offer me these popular features. The voice control works not bad on both devices, but sometimes for LG, I have to repeat some commands twice. The sound is almost similar on both units. The 65UK6300PUE doesn’t provide the cable management, so I can’t achieve a neat uncluttered finish. The 65NU8000 is supplemented with the cable management guides cut into the back. Despite the similar screen sizes, Samsung looks wider. The reason is a difference between the border’s dimensions (0.35" versus 0.75"). The build quality is amazing in both models. There are no creaks, unpleasant smell of a low-quality plastic, or gaps. All the connections are placed towards the side of the device, so I can easily reach them. The TV is great for gamers because of the low input lag. A small offset from the center contributes to the change of colors and brightness. I can hear annoying ticking emanating during the first device’s working seconds. After updating I can launch the Netflix or Amazon with only one button click. Instruction is understandable and the installation took me not much time. Some inputs are placed on the back side. It’s hard to reach them, while the TV is wall-mounted. The resident apps can be updated only after Internet connecting. I can’t delete most of them.